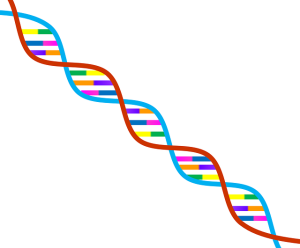 Epigenetics is the study of changes in the way genes are expressed that do not involve DNA. It turns out that DNA isn’t in charge the way we once thought it was—it’s the proteins around the DNA that really control gene expression. These proteins are influenced by the environment. This means that anything in the environment can have a profound effect on any organism, including animals and people. Research in the new field of epigenetics shows that many factors experienced by your pet, or even your pet’s ancestors—from vaccines, medications, diet, and even stress—can have effects that are passed down through many generations. Food is a major influencer of epigenetics; one’s diet has a powerful influence on health, aging, and susceptibility to diseases like cancer. While basic physiology is inherited, unlike DNA it can be changed within an animal’s lifetime. This is incredibly exciting, because now we know we can minimize or overcome many (though not all) conditions that may have come down through many generations. While we can’t always control what happens in our lives, we do control how we respond to events that do occur; and our responses affect our cells’ environment through hormones and neurotransmitters. Our cats and dogs are sensitive to our moods; our stress becomes their stress. And in many cases, our illnesses become theirs. It’s common for veterinarians to give guardians their pets’ diagnosis, and have the guardian say, “Hey, I have that disease, too!”—whether it be diabetes, kidney disease, or lupus. Now, this can be a good thing or a bad thing, but in reality it’s a mix of both. On one hand, it’s discouraging to know that no matter what we do, our pets’ health and longevity are to a certain extent pre-determined before birth. No matter what we do, a dog might still get cancer, or a cat may still have kidney problems. On the other hand, by doing the right things (including limiting vaccinations, feeding a great diet with appropriate supplements, eliminating home and yard toxins, and providing proper levels of exercise, mental stimulation, social interactions, restful sleep, stress management, and other factors), we can have a major positive effect on our pets’ genetics within their lifetime! So it’s worth it to do the best we can for our pets in all aspects of life.